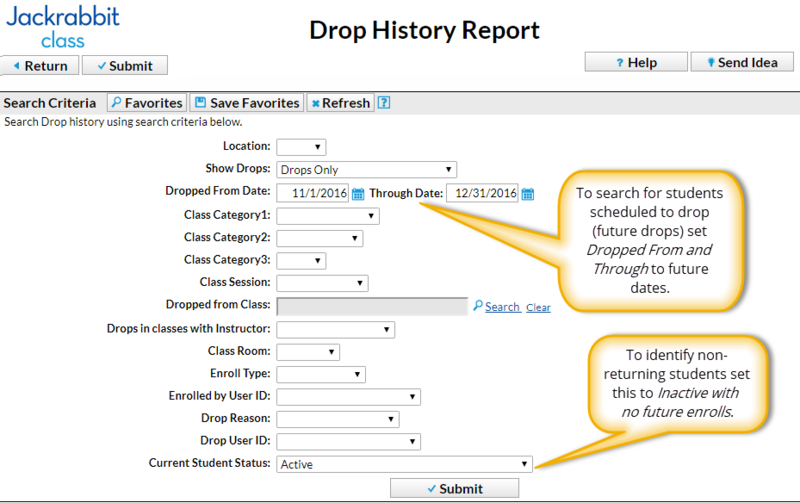 Located under the Reports menu, the Drop History Report shows students that have dropped classes. You can also run this report to show transfers, or students that have completed classes. In the Search Criteria, choose one of the following from the Show Drops drop-down list. Excludes drops resulting from a transfer into another class and drops on or after the end of a class (completed class). Shows students who were dropped on / after the end of class. Shows transferred students who were transferred from one class to another using the Transfer link. The report results will include: drop date, class, instructor, student (and family), family balance, phone, email, drop reason and number of days in the class. Use the Email button to quickly generate an email to all, or only select, students in the report.